Sapphire Glass. It sounds so lovely, doesn’t it? And for the past few months, it’s been used to talk-up the impending iPhone 6. But while Apple will no doubt wax poetic about this material upon the launch of its next-gen smartphone, the only way to tell if it’s more than just a gimmick is to see how it holds up against the current Gorilla Glass, and now, a video of the stress test that everyone’s been waiting on has emerged. As well as the standard drop test, the folks at repair firm uBreakiFix have posted a separate video entitled “Bending and Impact,” offering a fairly insightful assessment of what sapphire glass is all about. As well as being better apt to deal with these everyday situations, sapphire glass is also supposedly the more favorable choice when it comes to scratches, which have long since plagued smartphone users despite the numerous strengths of the ubiquitous Gorilla Glass. In witnessing sapphire glass being put to the sword, so to speak, by means of the scratch test, it’s clear that this emerging material is better suited to the role of protecting a mobile device’s display. Not only did it fare much better in the battle against the scrapes, but as the tests show, it’s also much less likely to succumb to impact damage when dropped. Gorilla Glass has certainly held the iPhone line-up nicely over the past few generations, but with a large portion of iOS device owners in general having encountered at least a minor shatter, the time has come for Apple to up the ante. 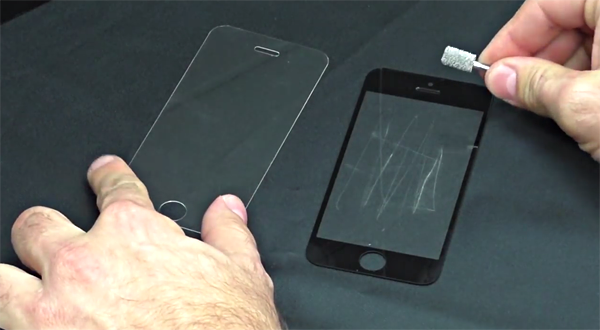 On evidence of these stress tests, sapphire glass appears more than up to the task, but while it looks a near certainty that the material will debut with the iPhone 6, reports have also suggested that only some models will be treated to sapphire glass. The last we heard, every single 5.5-inch iPhone would get the robust, ruggedized protection, but with rumors indicating that some 4.7-inch models will retain Gorilla Glass, it may well be that the Cupertino wishes to retain a lower-end offering at a more economical price point. As well as the iPhone 6, the elusive iWatch is also likely to feature Gorilla Glass, and with both smartwatch and smartphone slated for announcement in ten days’ time, we’ll soon be able to put the rumors to rest.